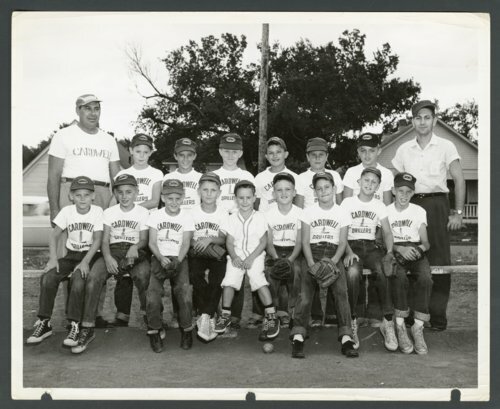 This photograph from the late 1950s is of the Cardwell Drillers youth baseball team in Wichita. The team was sponsored by Cardwell Manufacturing Company, a manufacturer of oilfield drilling equipment. Standing in the back row are (l to r): Martin Berndsen (manager); Skip Sneddiger; Bob Cox; ____ Goertz; Tommy Lee; Terry Smith; Gary Grey; and, Richard Hylton. Seated in the front row are (l to r): Mike Slicker; Steve Berndsen; unknown; Mike Hylton; Mark Berndsen (bat boy); Larry Schaar; Rod Goldinger; Gary Kerns; and Bobby Moore. The photograph was made by the Rorabaugh and Millsap Studio.